The Last Engishman is available on Ebook, paperback, large print paperback, hardback and now Audio! A real-life adventurer. A gruelling pan-American trek. Will one Englishman dare to face his fears? Short-listed for Outdoor Book of the Year by The Great Outdoors magazine. Born traveller Keith Foskett had thousands of miles of thru-hiking experience when he prepared for his toughest challenge yet: a gruelling 2,640-mile hike from Mexico to Canada. In a six-month journey along America’s Pacific Crest Trail, he crossed the arid expanses of California’s deserts, the towering peaks of Oregon’s volcanic landscape, and the dense forests of Washington. Battling phobias of bears, snakes, critters and camping in the woods after dark, can Foskett find new ways to achieve his ultimate goal when the worst winter in years bears down on the trail? Shortlisted for The Great Outdoors magazine Outdoor Personality of the Year and Book of the Year multiple times, veteran storyteller Keith Foskett lets you join him for a trek across the greatest long-distance hiking trail on Earth. With witty humour, astute observations, and a delightful cast of characters, you’ll discover a compelling narrative that turns the travelogue formula on its head. Discover The Last Englishman to embark on a journey of tenacity today! 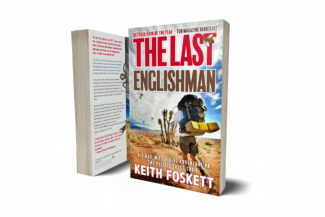 ‘The Last Englishman takes you on a grueling walking journey on the Pacific Crest Trail. The characters read so much like a well-crafted fiction novel, it’s hard to believe they are the living, breathing people that exist in this world. Laugh (and cry) your way through the trials of wilderness walking, the elation of new friendships and the revelations of a life well embraced.